S2 – Shot Putt Ewan Abercrombie Kimberley Scott. 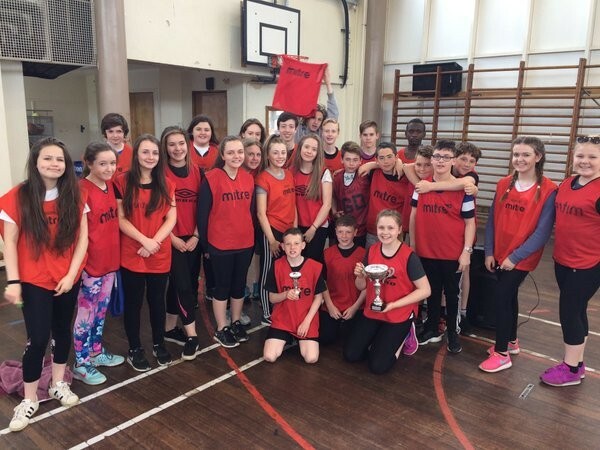 S1 – Relay 1st Dumbreck 2nd Colzium. When all the points were tallied up for each event Colzium House were victorious in both S1 and S2 competitions. Congratulations to all! The new timetable will begin on Monday 6th June and all pupils returning for S5 or S6 must be back at school that day. The Parent Council will meet on Thursday 2nd June, at 7.00 p.m., in the school. The first of our three uniform evenings will take place on Wednesday 25th May, from 5.00 – 8.00 p.m., in the senior café. There will be special deals available at each of these events. The remaining uniform evenings will be on 9th June and 20th June, at the same times. Our annual S2/3 Leadership Academy took place last weekend, at Kilbowie. The group of 37 pupils experienced fantastic weather and took part in a wide range of outdoor activities, in addition to learning about some of the key qualities of successful leaders. Many thanks to Mr Rennie, Mr Clowes, Mrs Stirling-Young and Magi Hamilton, for leading this fantastic opportunity. On Sunday 17th May, the PE department led a trip to see Newcastle United play Tottenham, in the last Premier League game of the season. It was an action packed game, which saw Newcastle winning 5–1. The 40 pupils had an excellent day out and thanks go to Mr Urquhart, Mr Buchanan, Mr Brown and Mr Stevenson for accompanying the group. A group of 39, S1 pupils enjoyed a three-day residential experience at Auchengillan Outdoor Centre. Undertaking a range of activities, such as orienteering, climbing, abseiling, kayaking and mountain biking. Despite the weather, the group remained in high spirits and had a great experience over all. Thanks go to Mr Urquhart, Mr Clowes, Miss Rae and Magi Hamilton, for leading the event and for all their encouragement throughout the three days. Friday 27th May and Monday 30th May will be school holidays, the only exception being for those sitting SQA examinations. The new timetable will begin on Monday 6th June and all pupils returning for S5 or S6 must be back at school that day. Gold – Millie Mason, Layla Morris, Sophie Bridges, Luke Fyfe, Lauren Cole, Cameron Love. Silver – Mark Donnelly, Amber Peoples, Kirsty McDowall, Rebecca Wilson, Rachel McIntyre, Eilidh Stewart. Bronze – Cameron Napier, Jamie-Lee McBride, Connagh Connelly, Emma McEwan, Emma Roberts. Our Uniform evenings are approaching, once again. They will be held in the school cafeteria on Wednesday 25th May, Thursday 9th June and Monday 20th June, each from 5.00 – 8.00 p.m. 9th June is also the Parents’ Evening for P7 pupils who will be joining us in Kilsyth Academy, in August. A number of special deals are available on these evenings. Pupils in S1 have been issued with their final tracking report for this session. Acknowledgement slips from parents should be returned to Tutor teachers ASAP. S3 Geography pupils had an opportunity to participate in fieldwork, in the local area, last week. The weather was very kind to them too and they were able to enjoy the sunshine as they worked. Due to the European Referendum, the school will be closed for pupils, on Thursday 23rd June, as Kilsyth Academy will be used as a polling station. This will now be an additional staff in-service day. The Captaincy Team organised a further two presentations to the pupils’ chosen charities last week. £750 was presented to SAMH, their national charity, and a further £750 to Mary’s Meals, their international charity. The team has made a tremendous effort, throughout the session, to raise money for a range of charitable causes. 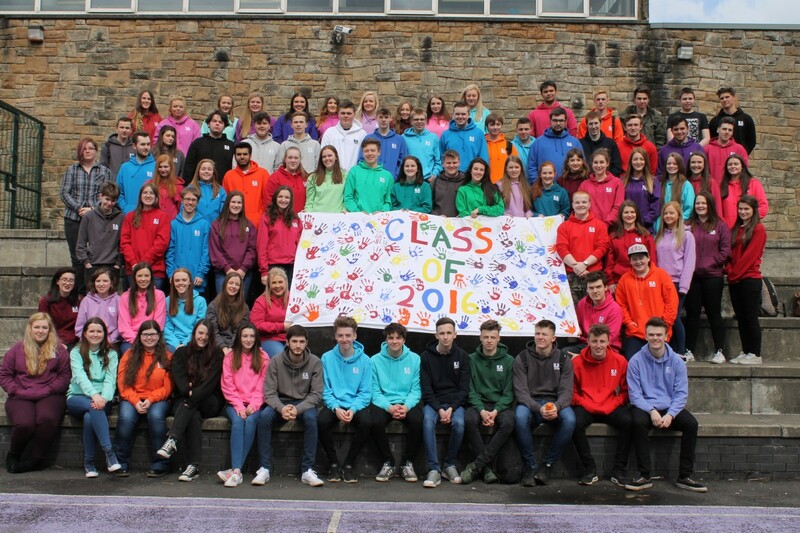 The Leavers’ Ceremony took place last week, for all pupils leaving from S4, S5 and S6. All the pupils received Leaving Certificates and were wished every success by School Captain Erin Main and by Mrs Caldwell. The Ceremony was followed by tea and coffee with the staff. Thursday 5th May will be a staff in-service day, due to the Scottish Parliament elections. The school will therefore be closed to pupils, with the exception of those sitting SQA examinations. Members of the public should access the polling station at the back of the school, using the entrance off Balmalloch Road. Our own Mock Election took place last week, with candidates from seven parties – Conservative, Green, Labour, Liberal Democrat, SNP, SSP and UKIP. Following a hustings debate to representative audience, all pupils had an opportunity to vote, using the double ballot paper system. Following the count, Amy Smith (SNP) was declared to be elected as our constituency MSP. The results of the additional member ballot were SNP 40%, Greens 20%, UKIP 15%, Labour 7%, LibDem 6%, Conservative 6% and SSP 6%. Well done to all the candidates, from S1 to S6, for participating in such a professional campaign. Girls Cricket Throw Katie Walker. At the start of the final events the 4 x 50 metres Relays, only five points separated the two leading teams, Lennoxtown and Balmalloch. After two close final races, Balmalloch won both Relays to take double points and surge ahead to retain the overall trophy with 89 points. Lennoxtown were a close second with 77 points and Chapelgreen in 3rd place with 50 points. The event was organised and run by Kilsyth Academy Sports Leaders as part of their course. Their willingness to work as a team and take on their various responsibilities made the event a very enjoyable experience for all athletes who participated. The Senior Inter-House Quiz took place with each House represented by three pupils – from S4, S5 and S6. Antonine House took an early lead and managed to hold on to that throughout, taking 1st place. Colzium were 2nd, with Balmalloch in 3rd place and Dumbreck 4th. Well done to all participants.